With all we know now about what was brewing in the Pacific in late November 1941, I return with amazement to the scene of the Wake contractors and Marines who found spare time for an “all-out poetry blitzkrieg.” After long days hammering, riveting, digging, and bulldozing, “the boys wore pencils down to the eraser and their fingers to a numb and wallowed for days in iambic pentameter, blank and free verse.” One doesn’t readily associate hard hats with poetry, but it was a fairly common pastime back in the day. As schoolboys, these men had memorized long poems and many penned verses for loved ones back home. Poetry was a much more common tool for them, fun to exercise and allowing an artistic vent. My father (who could recite Robert Service’s “Cremation of Sam McGee with ease) continued the practice all his life, writing verses to commemorate a new baby in the family, a landmark birthday, or to set the stage for a clever gift. 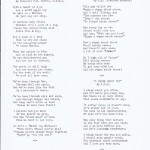 The result of the 1941 poetry blitzkrieg on Wake was a twenty-five page supplement to the Wake Wig Wag, the newsletter compiled by editor Louis Cormier. Cormier prefaced the supplement with high praise for the poems and authors: “A poem by a construction ‘stiff,’ a mucker, a shovel artist, or an office ‘punk,’ – well that’s a work of art! – for it comes from the Heart!” Many of the entries bore only initials or anonymous, but some of the contractors took full credit, including James Connor, Howard E. Cook, Joe Dunn, R. E. Forsythe, C. D. “Curly” Howes, J. B. “Cobbler” McDaniel, Dave Shenkman, Frank Thatcher, Jr., Woodrow Whittenberg, Joe Williamson, and E. J. Wilson, as well as a fair cross-section of Marines. “Ann Onymous” wrote about living on Wake . . .
It’s the whiteness from the coral reef! . . .
From E. J. Wilson’s “Play on Wake Island” . . .
To where bright colored fishes teem. Orange, purple, also pale blue. Each one is rare, none commonplace. And the restless Pacific pounds. . . .
And T. B. L.’s “Wake Island Lament” . . .
Pray hold your tongues and let us be! WHERE ARE THE DRUNKS OF YESTERDAY?	. . . Many yearned for the girls back home, as Winston Tuttle in “Song of a Lonesome Lover”. . . But it’s a lonely old moon for me. Who’s waiting back home for me. To her in the sweet bye and bye. . . .
And Willy in the “Post Office Blues” . . .
From you, my little darling, my baby dear. But by the time I get my turn there is no mail within. I see there wasn’t any use waiting, for you’ve forgotten me again . . .
For a piece of old bolognia! on those shiny golden stairs. and spend them in a day.